Thursday is set-up day, and so it just included the long drive up the mountains and unloading TONS of gear into the lodge. I had searched my fiber stash at home last month and pulled everything undyed that could possibly go into the dye pots. I split my unspun fiber into small bags so that friends could try out half an ounce of just about anything: Various breed of Wool, silk, and cellulose fibers. I also brought four boxes of threads on cones that could be reeled for weaving (or embroidery) — both cotton 10/2 and silk 20/2 threads. Several friends raided the stash early on Thursday night. I hope I get to see what they make over the years. Only one of my two roomies was there Thursday night. We nearly stayed up WAY too late, chatting and catching up, saying “Good Night!” three times before we finally drifted off. Friday morning, I was headed back to the lodge at 6:15 AM to start Coffee Bar of Splendoor. I like to have the coffee ready before 7 just for the other morning people. The day got VERY warm very quickly, so the class schedule was shifted to try to not have folks overheat. I spent the morning making measured warps for Andean Backstrap Weaving demos. Then in the afternoon, we held the rescheduled night “crafts tasting” in the air conditioned dance pavilion. My two roomies both wanted to learn “how to be like a five-year-old” learning to weave. 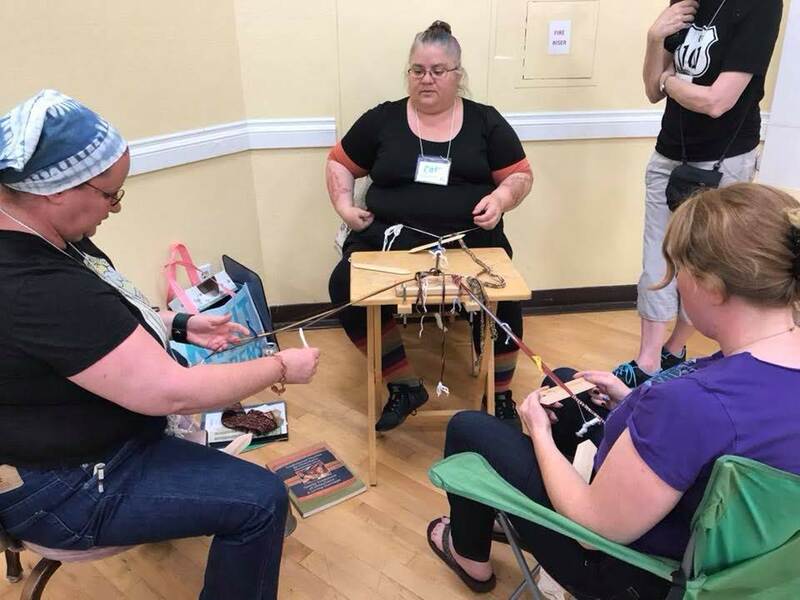 I definitely learned A LOT about how to demo the skills and help interested new weavers acquire understanding. Friday evening no one attended my drop spindle class before dinner, but Liz and I had fun spinning and socializing together. 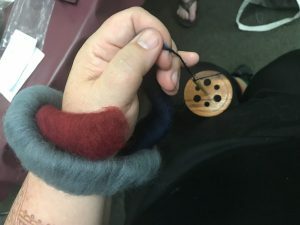 I went through my spinning fibers like a rich man counting money, finding some great fibers to send home with Liz, some to donate to the raffle, and something fun to spin as a quick sample. Then I started to learn about double-weave on a rigid heddle loom, using three rigid heddles for a 4-harness twill warp. It was slightly jarring to go from Andean weaving (with minimal tools and process-based solutions) to a western weaving structure (with tool-based solutions). But I got a good start before we all collapsed in a very hot cabin. Fortunately our other roomie found the fan in the closet to save us all! Yay! I woke even earlier Saturday morning… I don’t know why that happens. But I was in the lodge by 6:10 AM and had coffee ready earlier than usual. Once again, no one came to the scheduled drop spindle class. 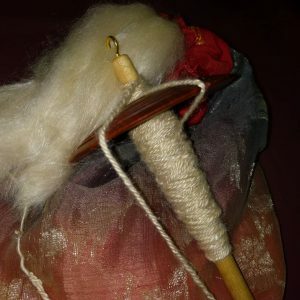 Another friend hung out with me, spinning for a while, and a special spindle went home with her. Then a new student dropped in right before lunch. We broke our lesson into two parts, before and after eating. I believe that she really got a great start on her new spinning skills. Our Featured Instructor was Melinda Sherbring (Mistress Eowyn). Somehow around her busy teaching schedule, she managed to hang out Friday as I warped up Andean bands of three-pairs. And now in the afternoon on Saturday, she was interested in weaving bands before her afternoon classes. We got to cover just a few skills, but her interest was definitely aflame! I attended a class on how to tie a “monkey’s fist” in a rope, which was fun. 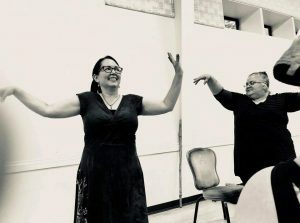 And then I taught “Slow Movement for Crafters” which was a blend of ATS slow bellydance and stretches using a chair as prop or seat. Many friends complimented my slow music playlist, and we all got to shake out the kinks in our bodies from hours of sitting still doing various crafty tasks. 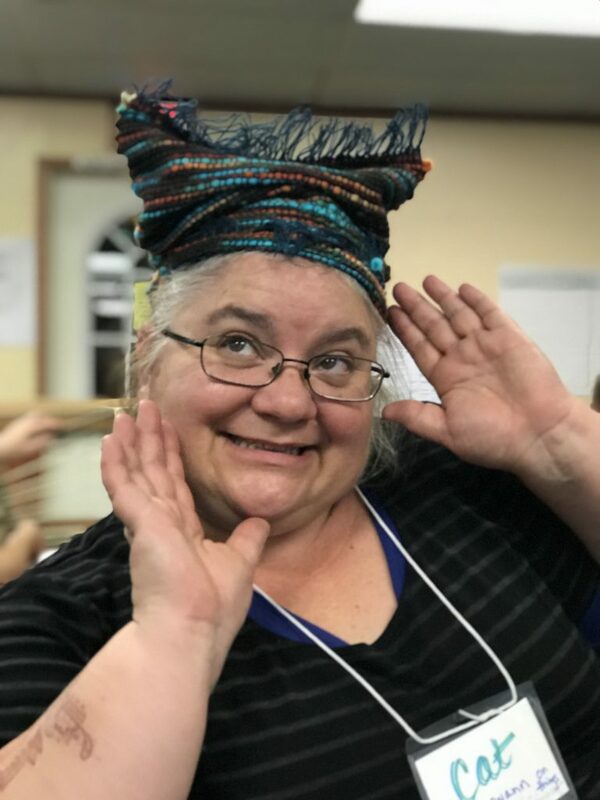 I was super pleased to win a few things in the raffle, including a South American print tunic, a wool felted bag, a small hand loom kit, and two spindles. I spent the rest of Saturday night finishing my double-weave bag, then collapsing in the cabin. We finally went to sleep near midnight. In the lodge by 6:15 again this morning, and then fully packed up and in my car by 10:15. I couldn’t have done it without such awesome friends. The car isn’t fully unpacked yet, but I couldn’t bear to unpack in 102°F (39°C) heat. Hopefully it will cool off soon. Overall, it was an excellent weekend. I loved spending so much time with old friends and making new friends. I found several things to improve for Andean Backstrap Weaving demos, which I look forward to implementing. And I got a nice start on the Tour de Fleece. The rest of July will be filled with spinning and spinning photos.